Navigators in Florida say they’ve had to re-do some of the applications for coverage on Healthcare.gov submitted during the first few weeks of open enrollment, McClatchy News Service reports. 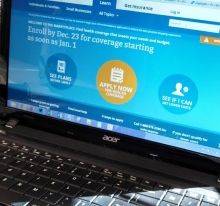 The lead navigator for Primary Care Access Network in Central Florida said many of the applications for the health insurance marketplace submitted over the phone, by mail and online have been lost. Technological glitches are being blamed for mistakes in up to a quarter of enrollment records filed in the first two months on the federal online exchange, the New York Times reports. Even now, roughly one in 10 applications being sent to insurance companies for processing could contain errors. People filling out insurance applications on the federal marketplace may learn they're eligible for Medicaid and their information is being sent to state officials to sign them up. However, states are getting unusable information because of technical problems that continue to plague the website. Today the Obama administration is launching a campaign to promote the benefits of the president’s signature health care law. In January, part-time workers who have so-called mini-med health insurance plans with very limited benefits and annual caps on payments will begin to lose that coverage. 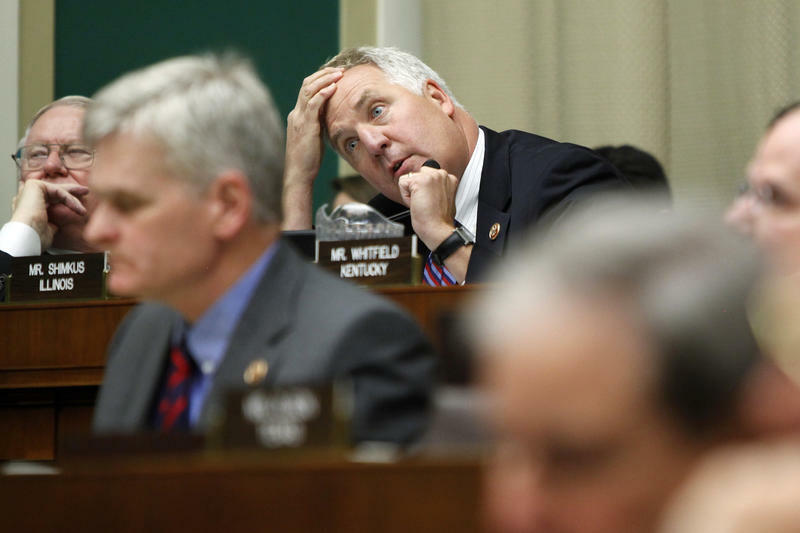 Under the health care overhaul, they can't be renewed after the beginning of the year. For some, that may be just as well. 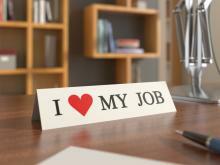 Part-timers likely will have better options in January. 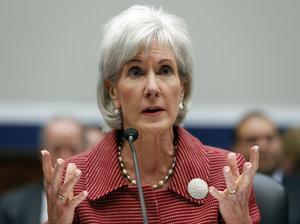 Another day brings another delay for the federal health law known as the Affordable Care Act. On Friday, the Obama administration announced that, starting next year, it is pushing back the start of the sign-up period for those buying individual and small business insurance until mid-November, rather than mid-October. That will give insurance companies some extra time to set their premiums, given this year's difficulties. And, as some analysts point out, the delay may also ease some political concerns for Democrats. By the time U.S. Health and Human Services Kathleen Sebelius arrived at North Shore Medical Center in Miami on Tuesday, Jacquie Basha had already been there for a couple of hours on her quest for health insurance that began seven weeks ago. Over a long period of daily attempts with the web site, she had opened an account, shopped for a policy and gotten a price. Finally, with the help of health care navigators on duty for the Sebelius visit, Basha got her health insurance. John Petrila's health policy class at the University of South Florida is full of undergraduate students glued to their smartphones, tablets and laptops. 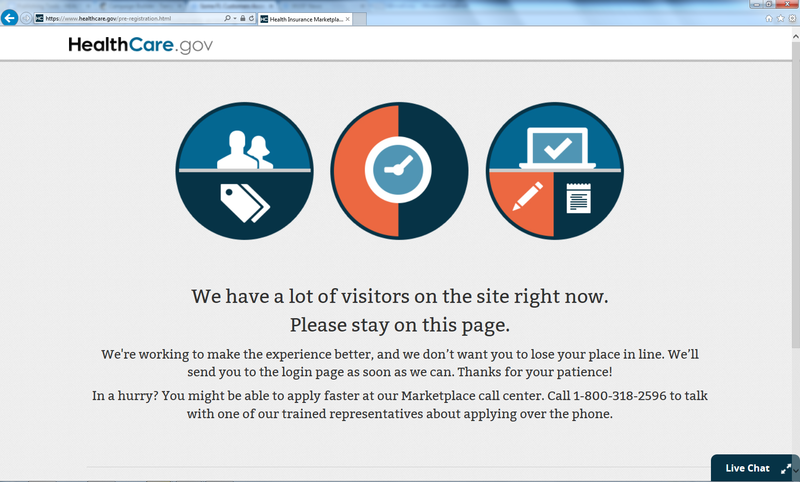 A perfect place, he reasoned, to test the Healthcare.gov website. “These folks are savvy. Every person in here is a tech savvy person whose used to being online,” Petrila said. “No one's in here thinking, ‘Well, what's the Internet?’ If these folks can't navigate this website, then that's a serious problem." Florida has rejected an offer of more than $50 billion over 10 years from the federal government to expand Medicaid coverage under the Affordable Care Act. So the question remains: how will health care be funded for more than a million low-income Floridians? This week on Florida Matters, a panel discussion that was held last week at Stetson University College of Law to discuss the options. It was sponsored by the Tampa Bay Healthcare Collaborative. Department of Health and Human Services Secretary Kathleen Sebelius said Tuesday that eight of 10 people will be able to use the government's health care website to sign up for insurance by the end of the month. The Obama administration's top health care official was at Florida Technical College in Orlando Tuesday morning making her first of two stops in the state to talk up the Affordable Care Act as fallout of the new law grows. She was visiting Miami's North Shore Medical Center later in the day. Florida Blue, the largest health insurer in the state, says it will reinstate 300,000 policies it was planning to cancel, the Fort Myers News-Press reports. Bowing to pressure, on Thursday President Barack Obama announced that individual policyholders who saw their insurance policies cancelled because they didn’t meet the standards under the Affordable Care Act could in fact keep their policies if the company was willing to offer them. From one end of Florida to the other, calls for Florida House leaders to accept $51 billion in Affordable Care Act funds to expand Medicaid to cover the state's low-income uninsured were renewed on Wednesday. Even Gov. Scott started flirting with Obamacare again. But the man who said no to the money before -- House Speaker Will Weatherford -- is still saying no. Remember the New England Compounding Center, which sent out contaminated pain injections that killed 64 people, including some in Florida? More than a year after that debacle, a bill that nearly everyone in Congress supports is being held up by an opponent of the Affordable Care Act. Thirty or so attendees at St. Mary Primitive Baptist Church in Tallahassee, Fla., gathered on a recent evening to hear a presentation by the Obamacare Enrollment Team on their options to get insurance under the Affordable Care Act. "If anybody is interested in getting enrolled, we can get you enrolled tonight," they were told. Signs outside the church looked official: A familiar, large "O" with a blue outline, white center and three red stripes. As if the rollout of the federal health law didn't have enough problems, abortion is back in the spotlight. How the various health plans in the exchanges would or would not pay for abortion was one of the very last issues settled before the bill was passed in 2010. Now abortion's invisibility on the federal HealthCare.gov website has some people pretty upset. 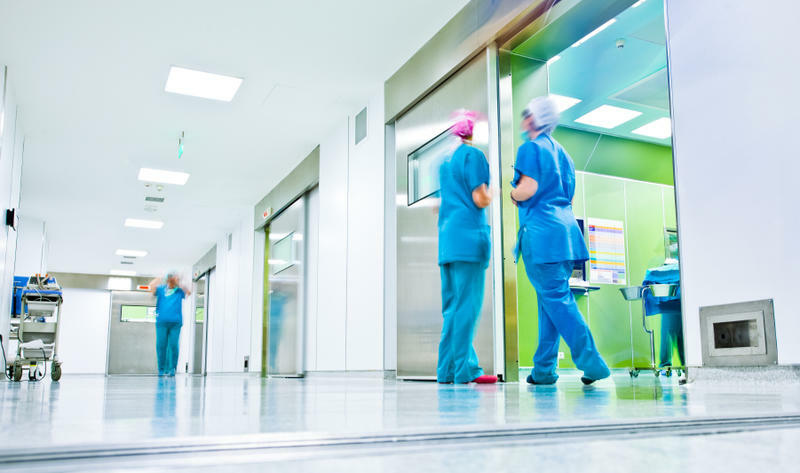 A majority of physicians who responded to a Florida Medical Association survey this month said they support expanding the Medicaid program to cover more indigent and working-poor adults, FMA reported Tuesday. But that's not the group's number-one goal for the coming legislative session, so it's unclear whether FMA will lobby for it. Monday was yet another troubled day for the Affordable Care Act. Sunday night, the outside vendor that operates two key parts of the website that lets people browse and sign up for health insurance experienced a failure. The failure took place at a vendor called Verizon Terremark and presumably affected other clients as well as HealthCare.gov, the federal website that people use to sign up for insurance under the Affordable Care Act. Some Florida Latinos are waiting on the Affordable Care Act’s Spanish language website to become available so they can sign up for coverage. 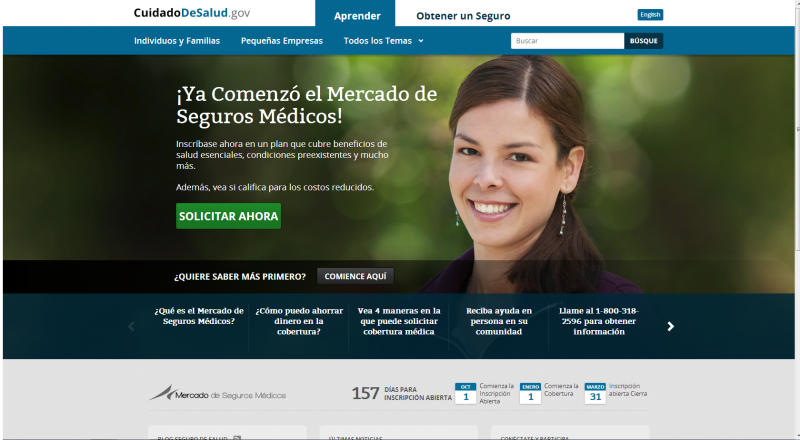 The Spanish-language version of HealthCare.gov, CuidadoDeSalud.gov, was supposed to be up and running this past Monday, but instead, the U.S. Department of Health and Human Services is directing users to its Spanish call center. Altamonte Springs resident Miriam Lopez said she heard it’s better to apply online, so she’s been reluctant to enroll by phone. Federal contractors now say they’ve identified most of the main problems crippling Healthcare.gov, the main site of the online health insurance marketplace set up under Obamacare. 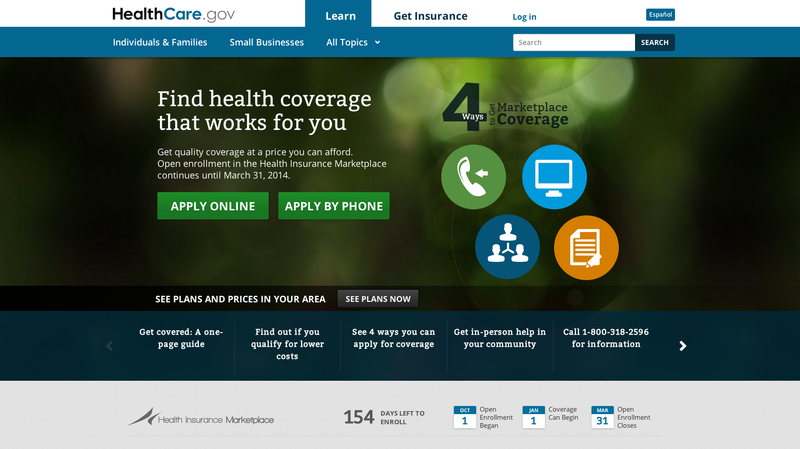 Florida's online health insurance Marketplace has been open for business since Oct. 1. But more than a week later, people are still having trouble with HealthCare.gov, the website consumers use to shop for health plans. Maggie Banta of St. Petersburg is one of millions of visitors to the site since it opened for business a little more than a week ago. She’s been trying to log on for days, but like many others, she can’t. Floridians have enrolled in health insurance plans offered by Cigna using the new online insurance Marketplace, the Washington Post reports. 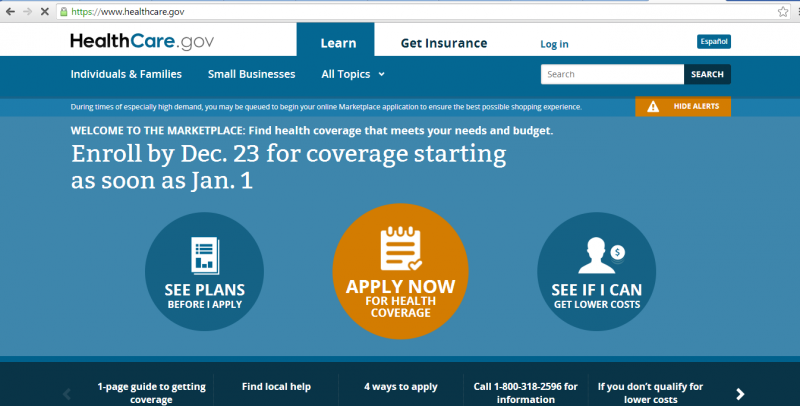 The new Marketplace is supposed to open online as a shopping site for the uninsured tomorrow, but according to two new polls, plenty of people still don't know about them. 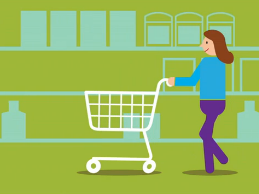 According to a survey by the Commonwealth Fund, almost 70 percent of uninsured people don't realize they will be able to shop on the online Marketplace for health coverage (at healthcare.gov) starting Tuesday. The Pulitzer Prize-winning fact-checking team at PolitiFact has compiled a list of the most common outrageous falsehoods about the Affordable Care Act and printed it online in a format that links to an in-depth explanation for each one. The sticker price for a benchmark health plan in Florida's online Marketplace will average $328 a month, far below the price that had been forecast, according to a federal report released early Wednesday. 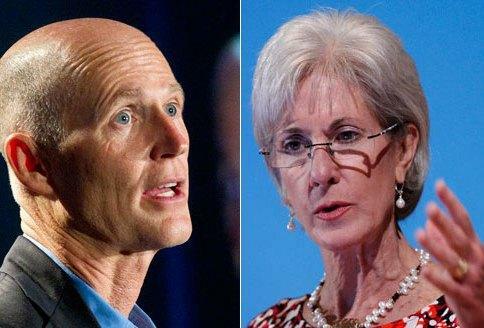 “We are excited to see that rates in the Florida Marketplace are even lower than originally projected,” said Health and Human Services Secretary Kathleen Sebelius in a press release issued later. Even though the Affordable Care Act was signed into law three years ago, confusion over what it does and doesn’t do has reached a fever pitch, with both deliberate and accidental misunderstandings careening around the Internet. 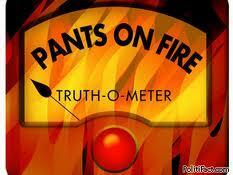 Fact-checking organizations are trying to keep up. New federal health insurance rules are inching closer to a January 1st deadline. The requirement that most Americans obtain coverage is feeling very real for the uninsured or those who buy their own policy. The Tampa Tribune’s Mary Shedden talked to some Tampa Bay residents deciding whether the Affordable Care Act will help their health, or hurt their bottom line. Bob Linde’s watched the Obamacare debate carefully the past five years. US Rep. Ted Yoho of Florida, one of the Tea Party Republicans trying to strangle the health law, compared those in his coalition to “Rosa Parks, Lech Walesa and Martin Luther King” in a speech on Thursday, the New York Times reports. The leader of the minority Democrats, Nancy Pelosi, called the group “legislative arsonists” who have “hijacked” their party. A vote is expected on Friday.